But the more I looked at the recipe, the less it resembled the dish that had enraptured me so. The proportions just didn’t seem likely to result in that silky texture – or that heavenly color! And my only previous experience with roasting hot chiles involved a certifiably psychotic ex-roommate who nearly burned down the apartment building and stunk it up with fumes so toxic, I slept elsewhere for several nights. Still, being the intrepid blogger you’ve come to know and love, I knew I had to give this recipe a shot. Some of my concerns turned out to be completely legit. Others were a clear case of analysis paralysis. The short version: This recipe does not cook up into the restaurant version, no way no how. But it is good in its own way, and worthy of future experimentation. The recipe calls for poblano chiles, and I don’t know the first thing about peppers so I went to the farmers market in search of advice. After failed consultations with the two least talkative farmers I have ever encountered at the market – vendors are usually happy to go on and on and on about their beloved produce -- I finally found a woman who assured me that her glossy dark green, heart shaped peppers were, in fact, poblanos, although the sign said “ancho peppers.” When I later Googled “poblano chiles,” I learned that there is a fair amount of fudging when it comes to chile nomenclature and it is not unusual for one variety to masquerade as or substitute for or transmute into another. Officially, poblano peppers become “anchos” when they are dried. But when I prepare a recipe for the first time, I try to follow it exactly, so I purchased four fresh, fist-sized “poblano peppers” and hoped for the best. Years ago, I’d watched my psychotic ex-roommate stab each pepper with a wood-handled fork and hold it over an open flame, turning it slowly to achieve a crackly char on all sides. 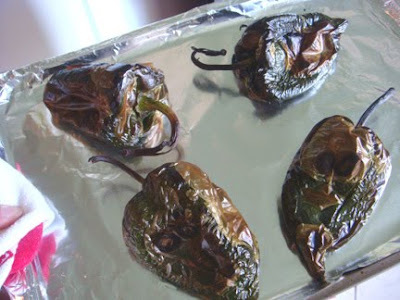 Since I had a bunch of peppers to process and I didn’t have all day, I asked my ancient oven to crank itself up to 450 degrees before sliding the alleged poblanos inside to toast all at one time, on a foil-lined baking sheet. After a few minutes I used tongs to turn the peppers over, so that all sides would be blackened. When their skins looked evenly puckered and charred, I pulled the baking sheet from the oven and used tongs to toss the peppers into a large Ziploc bag, which I sealed and set aside for a while. The residual heat from the peppers steamed their papery skins during this cool-down period, so when I donned gloves for what I expected to be a laborious process of pepper exfoliation, I was delighted to find that the skins slipped off with very little effort. Getting rid of all the seeds was another affair entirely. Those little suckers stuck to my gloved hands, dotted the baking sheet and clung to the previously-almost-cleaned pepper slabs. I wonder if it’s okay to remove the seeds before you oven-char the peppers? It seems like that would be a lot easier. But eventually I managed to produce a relatively seed-and-skin-free pile of peppers, so I celebrated my small victory and moved on. It was at this point that I realized that my mac would not turn out to be the same color as the dish I was served in Scottsdale. These peppers were much darker, almost black after being roasted. I plopped them in the blender and turned the knob, hoping for a miraculous transformation, but all I got was a finely pureed format of the same dark green. Ah, well. Maybe next time I will use the brighter green Anaheim chiles along with a Scotch Bonnet to amp up the heat, or try the coveted New Mexico Hatch chiles that appear for a few weeks each September. Right now, though, there’s a recipe to finish. Once the peppers have been processed, this mac and cheese goes together in no time flat. You sauté some onions, garlic and red bell pepper, and toss this with cooked pasta, pureed chiles, grated Pepper Jack and a bit of cream, and serve. Wait – what? Serve? What about the oven? What about the topping? I, of course, couldn’t let it end there, since one of the foremost charms of the delectable mac I’d enjoyed at Roaring Fork was its crunchy topping. When I dined there, the restaurant manager admitted that they’d changed their recipe a bit since the one he handed me had been printed – they now omit the corn kernels that you’ll see listed among the ingredients in some versions of the recipe, and they make no written mention of the perfectly magical topping I now sought to reproduce in my own kitchen. 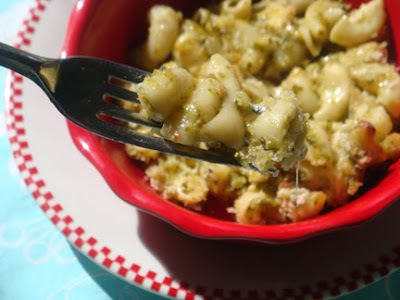 My mind drifted back to that happy day in Scottsdale, and I could almost hear the crunch of that big silver spoon breaching the crispy topping on the green chile mac in that adorable little cast iron kettle… Sigh! I decided that panko crumbs would do the trick, so I poured my mac and cheese mixture into a greased baking dish (alas, no adorable miniature kettle) and dusted the top with a generous layer of panko, then drizzled that with some melted butter that was left over from something else I cooked that day. (I am nothing if not resourceful, and you better believe that no bit of butter goes to waste in my kitchen, mister.) The dish went into a 350 degree oven just long enough to toast the topping. I honestly could not wait another second. I had to try it immediately. Well, it wasn’t how I’d hoped it would turn out…the color was all wrong, and there was no cheesy sauciness evident. I consulted my photos from the restaurant, which testified to the distinctly creamy, slightly gooey texture of the mac and cheese I had enjoyed there. No such luck with the stuff in the pan before me. 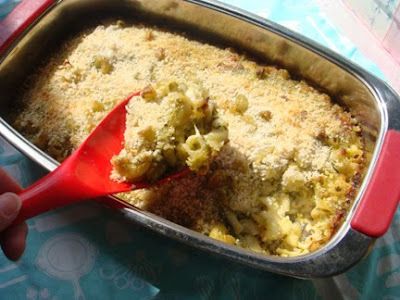 However, the sautéed onion and pureed chiles did keep this homemade mac moist – just not creamy at all. The zippy flavor of my beloved Firehouse Jack was evident but it did not supply the velvety texture I sought. Lessons learned? Half a cup of the even most excellent cheese is insufficient for even a very small quantity of a proper mac. 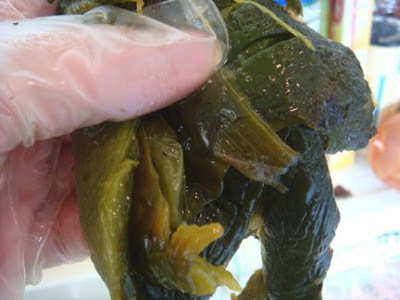 No blender can turn a dark green chile into a light green puree. One could consume an entire baking dish of this stuff and never achieve a pleasant tongue tingle. And no kid I know would eat this stuff, under any circumstances, because it looks kind of gross. So okay, it’s nothing like the restaurant version. But it is still distinctly tasty, and the leftovers heat up well. The next time I attempt this recipe, I sure won’t follow it exactly. In fact, I think I’ll graft this recipe’s unique ingredients onto another recipe entirely, one that has proven itself in the creamy consistency department, rather than introduce new elements into this recipe. I believe the luxuriously silky, cheesy mac I enjoyed at Roaring Fork can only come from a legitimate sauce that is prepared separate from the noodles, not just loose ingredients tossed with it. There must be a nice, melty Mexican cheese that could form the basis for a velvety green chile cheese sauce. I hereby dedicate my life to discovering it. And the next time I pick up some Mike’s Firehouse Jack from my cheese guy at the farmers market, you can bet I’m going to splurge on some of his handcrafted butter to enhance the next batch of mac. Mmmm. Heat oil in a heavy pan over moderately high heat. Saute bell pepper, onion and garlic until tender. 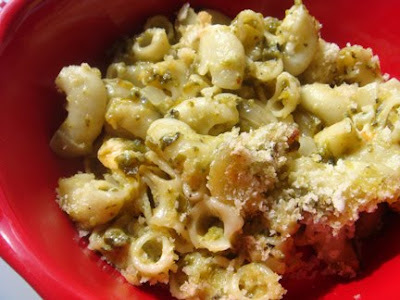 Add macaroni, poblano puree, Pepper Jack cheese and cream.